In 2011 it is planned to learn and to start production of 11 tire models of 8 sizes. To date, 7 models utilized by the end of the year is planned to start production of the new model has 4. Toward the end of the year production is expected to bring to the design capacity of 1.2 million pieces of tires per year. Among the main characteristics of the claimed new tire models — increasing the carrying capacity of up to 8 percent and reduce fuel consumption up to 10 percent of the cars. According to tests carried out by the magazine "Flight" KAMA tires "are energy efficient thanks to low rolling resistance." When testing instruments recorded a record low specific fuel consumption — it is down almost to the turn of 30 l/100 km. New tire models are also distinguished by the presence of wear indicator by which it is possible to keep track of the remaining tread pattern without the use of special measuring devices. KAMA tires Series N c 202 classification designed for movement on the asphalt surface, rough terrain, dirt roads. Abbreviation NF is the use of tires to be mounted on the front axle, NR — fitting on the rear axle. In addition to steel tires KAMA on the capacities of Nizhnekamsk SSC plant manufactured the world's leading tire manufacturer Continental. In September last year, with the German company Continental signed a contract for the production of tires for the system off-take (the production of tires on order for other brands). The first bus under the name Continental Nizhnekamsk production left the assembly line in late January 2011. 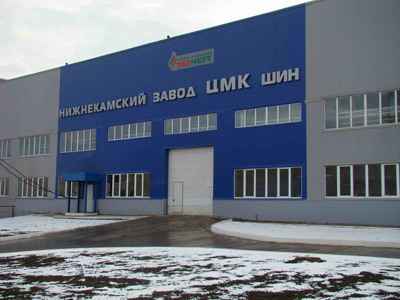 Nizhnekamsk SSC Tire Factory for trucks and buses, was launched in 2009. The project company "Tatneft" producing tires with solid steel is the most promising areas of the business. New tires used on trucks, buses, tractors increased weight.